The company doesn't think that customers are ready to embrace EVs. We have a bit of a love-hate relationship with Lexus right now. The brand's current design language polarizes opinion more than any other, yet Lexus continues to build quality cars with good driving dynamics and a premium feel. However, Lexus appears to be falling way behind in terms of technology. Toyota and Lexus were some of the first automakers to embrace hybrid technology, but have been dragging their feet on EVs. In an interview with the Detroit Bureau, Lexus explained its position on the future. When asked about EV technology, Lexus brand head Yoshino Sawa said “Of course we’re developing EV technology, we’ll introduce that kind of vehicle at a suitable time.” We know that Toyota is currently developing an EV model in a joint venture with Mazda, which we could see by 2021. This seems like a long time to wait, while competitors like Jaguar and Audi are close to launching EV models. Toyota is banking on a breakthrough in solid-state batteries. In an ideal scenario, this battery technology could help Lexus leapfrog the competition when it does reveal its first EV model. Sawa believes that “not many people will accept" the current battery technology in cars. 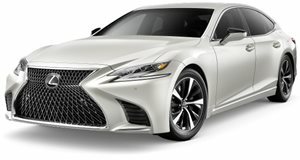 Lexus is about to have a big release with the new LS500. We don't know how big of a seller the LS will be due to the rise in popularity of SUVs. “Some buyers will never walk away from luxury sedans,” said Brian Bolain, Lexus US marketing chief. Lexus does have a strong SUV portfolio with the RX and NX, but the GX and LX are slow sellers. Lexus has also dealt with uncharacteristic drops in quality according to J.D. Power surveys. This drop isn't because of engines, but because of poor infotainment. “For a brand that was, historically, at or near the top, it doesn’t feel good to us,” the marketing chief acknowledged, stressing that Lexus should fix its tech troubles with new models like the 2018 LS. We still think that Lexus builds great cars, but it needs some help keeping up with technology. Lexus hybrid models are hit and miss with us, and we wish that the company would hurry up and build an EV.